If you’re wondering why posting has been all over the place, it’s just due to a busy schedule. I’ve got so much on my plate at the moment that I think I need a second small salad plate just for the extras. Maybe a desert plate as well. And a couple dinner rolls. And a coffee. Cream and sugar. The point is there’s just a ton of stuff going on. 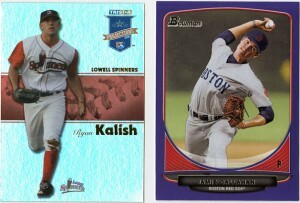 A couple days ago I was graced by not one but two PWE’s from my buddy Pat over at the Hot Corner. PWE #1 had a trio of 2010 Topps. The Captain, Jonny Lester and Jeremy Hermida, who if I’m not mistaken, is playing for the Brewers these days. PWE #2 kicked it up a notch. Pat sent a long a nifty 2008 Tristar Ryan Kalish refractor (they call them “reflectors”) and a purple parallel Jamie Callahan from Bowman. I didn’t have either one of these. 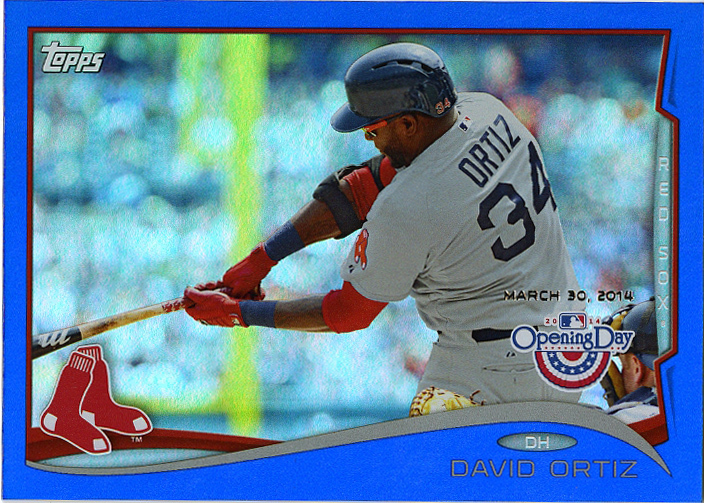 Last but not least, he finishes off the package with a blue sparkly Ortiz from Opening Day. That’s my kind of parallel.